Even tourism is picking up. 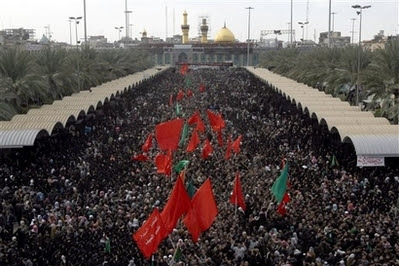 Two million Shiite pilgrims attended the Ashura celebrations in the Holy City of Karbala this past weekend without incident. The religious cities of Karbala and Najaf are prospering once again due to the influx of wealthy Gulf Arab Shiites to their shrines, according to Najaf’s Governor Asaad Abukalal. The two cities currently enjoy relative quiet but officials fear the recent upsurge in violence in other cities in southern Iraq may scare foreign visitors once again. Najaf and Karbala are home to Muslim Shiites’ holiest shrines. For the nearly 120 million Shiites in the world they are second only to those of Mecca and Medina in Saudi Arabia. The governor attributed the recent boom to “positive improvements in security” which he said had lured wealthy Shiites from Saudi Arabia, Kuwait and Bahrain to visit. In modern times, Najaf and Karbala have heavily relied on tourists from the rich Gulf countries. Pilgrims used to flock in their tens of thousands in decades prior to former leader Saddam Hussein’s ruinous wars in the 1980s and 1990s. Abukalal said Najaf and Karbala saw a real boom in tourism in 2003 shortly after the U.S. invasion. Scores of hotels were built in the two cities, property prices mushroomed and unemployment had all but disappeared. But as violence escalated, foreign visitors stopped arriving. Even Iranian pilgrims, who normally make up the bulk of visitors, halted their regular weekly tours. In the past week and at the height of the religious festivities of Ashura, Abukalal said there were at least 25,000 pilgrims from the rich Arab oil states. “The resumption of visits by the Gulf States and in such numbers is a good thing for the economy and an indication that tourism is on its way to prosper once again,” the governor said. The improvement in security during the latter half of 2007 has indeed increased religious tourism traffic to Nejaf and Karbala. These two provinces have experienced strong economic growth mostly from tourism and national oil revenue from Baghdad. The stability became most noticeable especially since Muqtada Al-Sadar disbanded his militia. Young men who had no jobs and joined these militias have jobs now and recruiting grounds for militias are drying up. The Iraqi government announced that it expects 700 thousand new jobs for the unemployed in this year. This is one of its efforts to combat unemployment. At the same announcement the Iraqi treasury secretary (Baqer Jaber Al-Zubaidi) denied the existence of any reduction in benefits of personal ration cards. Al-Zubaidi added, in the Wednesday press conference, It is expected that the national allotment for ration cards will increase in the first half of 2008 by five hundred million two hundred thousand dollars in addition to supplemental allotment if needed. Since GRN was activated Jan. 25, 2004, it has completed more than 1,300 reconstruction projects in 66,000 square miles of northern Iraq. With U.S. government funds, the reconstruction program has provided a jumpstart to the governance and economy of Iraq . U.S. customers, such as the Provincial Reconstruction Teams, Department of State, Brigade Combat Teams, Military Construction, and the Multi-National Security Transition Command-Iraq. with local projects. In the seven northern provinces that comprise Pfenning’s district, that includes more than 580 schools and primary healthcare clinics; 180 electrical projects; 233 security and justice facilities; 260 water and sewage treatment plants; 40 oil improvements; and 100 roads and bridges. Ongoing construction contracts include an average of 643 Iraqi workers a month, based on the last two fiscal quarters. There is no mistaking the monumental amount of hard, back breaking work our men and women serving in Iraq are performing. Training Iraqis, bringing in the Sunni tribes, facilitating neighborhood watch programs, developing and improving infrastructure, providing and improving medical care, all these efforts, coupled with Iraqis willing to improve their country and take ownership of it, is bringing about the vast improvements over the last months. UPDATE: The Iraq Oil Ministry announced today that the levels of exported oil and revenues in 2007 rose by 9.2 compared to the previous year.